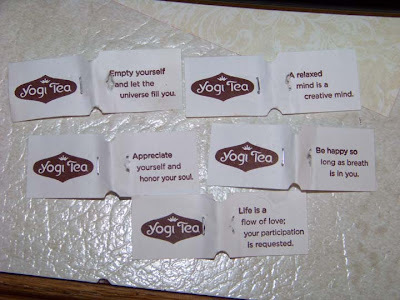 I’ve taken to Yogi Green Tea lately. It’s very good! For the first couple of boxes I never noticed the paper tabs at the end of the string….they have little bits of wisdom printed on them! I can’t tell you how many of these little papers got thrown out unnoticed. Now, they are a part of my little ritual with my cup of tea. I look forward to the message each bag brings me. They are very enlightening and uplifting. I thought I would share them with you. I like this one best: ” Life is a flow of love; your participation is requested. Wow – I’m a recent green tea convert – I’ll have to see if we can get that tea here in Australia.